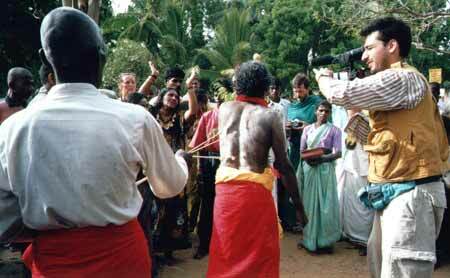 Kavadi scene: Cameraman Marco Franzoni (right) captures kavadi for Discovery Channel audiences. Hanging from hooks: Shooting a scene of 'flying kavadi' for the Discovery Channel documentary. (Kataragama: 12 July 2000) The Discovery Channel, a US-based television documentary network, has dispatched one of its television teams to Sri Lanka from 6-19 July 2000 to produce a documentary about the Kataragama Pada Yatra and Esala festival. The finished 18-minute segment will be telecast worldwide as part of a Discovery Channel special documentary. Director Ms Heidi Ewing of Gabriel Films (USA) is presently in Kataragama with producer-cameraman Marco Franzoni of Italy along with Sri Lankan support from the Kataragama Devotees Trust (KDT) and Warner Innovations. The film unit just returned from Pottuvil, Panama and Okanda where it videotaped scenes of foot pilgrimage, jungle wildlife, and interviews with pilgrims. In May director Ms Ewing happened to find the new Internet website of Kataragama (www.kataragama.org). Her original intention was to make a documentary about kavadi rituals at Palani in South India. But one visit to the extensive KDT website was enough to convince her that the multi-religious Kataragama Esala festival would provide the most on-screen variety and colour. According to Ms Ewing, American television viewers are completely unfamiliar with Kataragama or, for that matter, Sri Lanka at all.  The present documentary, masterly crafted with technical input from Sri Lankan director and Kataragama devotee Manik Sandrasagra, will give worldwide exposure to Kataragama and place it overnight on the map of adventurous spiritual seekers everywhere. Ms Ewing says that she would like to undertake a series of co-productions in collaboration with the Kataragama Devotees Trust and the Cultural Survival Trust of Sri Lanka in the near future but declined to give details. "It will be a big surprise for Sri Lankan and American television viewers alike, so please stay tuned," she says. "The world deserves to learn about Kataragama as its traditional custodians understand it," says Sandrasagra. "Only when the rest of the world raves about Kataragama will the average Sri Lankan once again respect our cultural heritage the way older generations once did." Note: This documentary was telecast in North America on The Discovery Channel on January 21, 2001 and rebroadcast on April 29, 2001. More about Kataragama Devotees Trust activities.